At Adams State University (ASU) in Colorado, a controversy has been brewing over the questionable use of a hastily-enacted persona non grata policy against former faculty member Danny Ledonne, whose only offense, as best we can tell, seems to have been establishing himself as a critic of certain ASU policies and practices. Ledonne worked part-time at ASU, teaching up to three courses a semester, from 2011 until 2014, then one year as a full-time visiting professor, with full benefits; his contract wasn’t renewed last spring. Since then he’s launched a watchdog website, Watching Adams, that explores publicly available salary data and compensation issues, and accuses the university of violating the Colorado Wage Act by making adjuncts wait until the end of the semester, or longer, to get paid for their work. Ledonne says it’s been difficult to get university officials to comply with open records requests, but the data he’s dug up is startling. “While most ASU faculty and staff make less than 80 percent of their peers at other institutions, approximately 24 administrative positions are paid at 100 percent or above of their peers, some at 120 percent or even greater,” the website reports. Your presence on campus presents a concern to the campus community; is disruptive and/or you have been previously warned that such behavior will not be tolerated. Based on the available facts, this is highly questionable at best. To say that one might be a thorn in the side of a campus administration is vastly different from asserting that such a person is necessarily a threat to the safety of the campus. 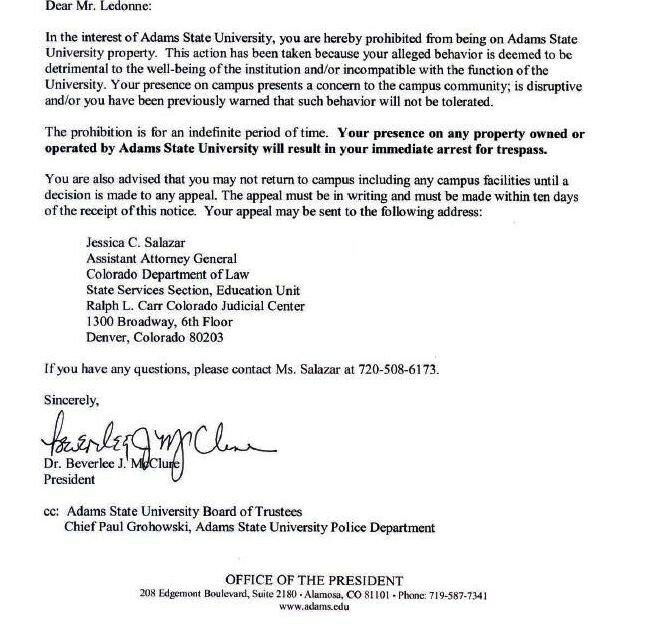 ASU presents no evidence whatsoever of its claim that barring Ledonne from campus is necessary to ensure the safety of the campus, and we can see no reason to take ASU at its word. By all appearances, ASU has joined the ranks of institutions around the country citing bogus safety concerns to stifle expression and silence critics. And, rather amazingly, Grohowski seemed to confirm just that impression in an all-campus email sent October 28. In his email, the police chief presents a number of “facts” pertaining to Ledonne’s employment and his relations with the administration. Ledonne responds to the charges one by one at Watching Adams here. My decision and recommendation to disallow this or any person access to our campus is based on the needs and safety of the ASU community which clearly outweighs the special interests of the singular. In this post-Columbine, hypersensitive world of mass shootings and violence on college campus’ nationwide, it is my duty to balance the free speech and individual rights against the public safety of the many. As your Chief of Police it is my duty to assure the sense of safety, security and comfort to all who attend and work here at Adams State University. Although, Mr. Ledonne’s behavior has not yet breached the realm of violation of our laws, my recommendation to ban him from campus is sound, rational and errs on the side of public safety. Though we’ve seen this kind of safety-at-any-cost mindset on display at many universities before, rarely have we seen it so explicitly embraced as a matter of institutional practice. Grohowski, like too many others have done before him, cites a past school shooting to justify taking action against an individual who poses no apparent threat to ASU—proclaiming hypersensitivity as a virtue, no less. Even more remarkable is the last sentence, in which Grohowski admits that Ledonne’s actions have been fully law-abiding, before stating that ASU was justified in banishing him from campus under threat of arrest anyway. 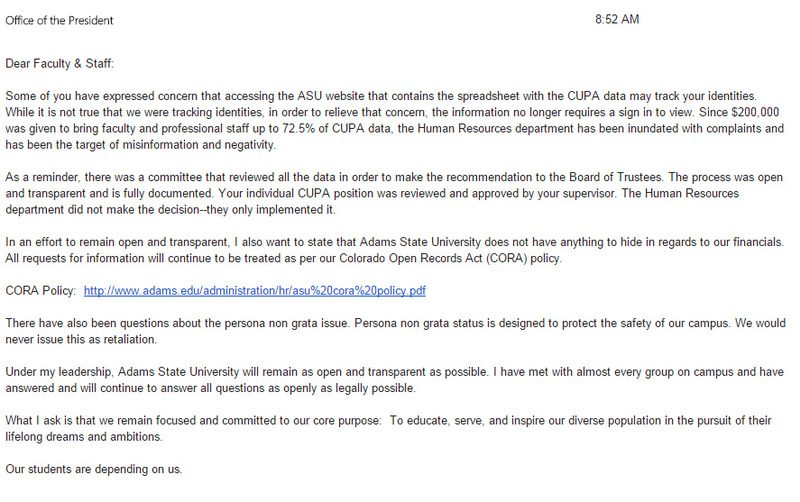 ASU’s persona non grata policy specifically applies only to non-university individuals. But if ASU is willing to go to such extremes to remove a campus critic, why shouldn’t we expect that it would disregard the rights of its students and faculty in similar situations? We’ve seen it happen plenty of times before, after all. Suffice it to say, students and faculty at ASU shouldn’t be taking the statements on Ledonne’s trespassing as guarantees of their safety, but as signals of just how fraught the environment for free speech at ASU can be.